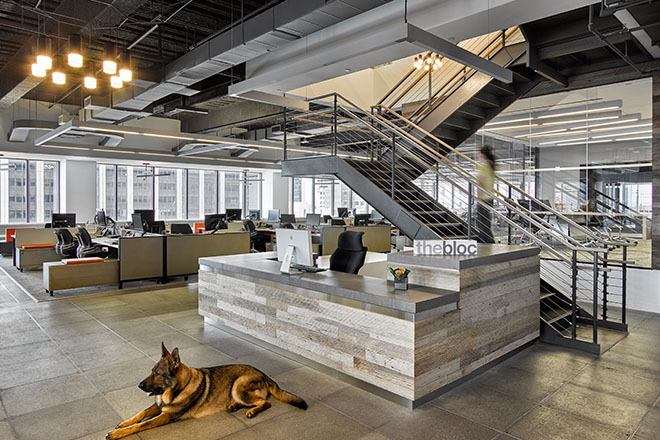 We wanted a nod to the industrial feel of the lofts and old spirit of the Financial District with raw steel desks and solid oak worksurfaces—Teknion was willing to custom-make its District workstations from these materials when no one else was. Foz Design‘s inspired work space for branding agency The Bloc promotes collaboration without sacrificing privacy or compromising creativity. After a decade and a half in business,The Bloc, an internationally acclaimed New York City-based creative agency, has bolstered a multiplicity of pharmaceutical and other healthcare companies by defining their brands and developing their success as corporate giants. Along the way, The Bloc’s own identity as one of the most successful creative branding companies for the healthcare/wellness market has crystalized and grown. So when it marked its 15-year anniversary by moving into new offices to accommodate its recent growth, The Bloc’s management was keenly interested in creating surroundings that would not only reflect its highly honed brand, but also reinforce the foundation upon which its own success was built. After a history of operating out of loft spaces in two buildings in the Flatiron District and servicing big corporate clients like Merck, Pfizer, Novartis, and AstraZeneca, The Bloc’s swelling workforce eventually outgrew its original offices. So, like many creative companies, it opted to consolidate its employees and relocate to one space in a building in Lower Manhattan’s Financial District, where reasonable rents and emerging retail and amenities serve as attractive lures to the area as it continues to rebuild. Designed by Foz Design in collaboration with The Mufson Partnership, A NELSON Company, as architect of record, and located on the 15th and 16th floors of a glass-clad 1980s-era office building, the new offices artfully merge The Bloc’s creative roots with a fresh spatial configuration, new furnishings, and workplace tools that bring it to a new functional and visual level. “Although The Bloc works with corporate clients, the employees themselves are creative and ‘uncorporate,’” says Fauzia Khanani, principal of Foz Design, of the driving idea for her aesthetic approach to the office design. “They had worked in industrial loft spaces for many years, so they wanted to replicate that part of their culture here and take it to another level,” she adds. The ultimate goal was to create a casual atmosphere that would inspire creativity and promote collaboration among creative teams in an efficient space. Both the client and the architects also wanted to take full advantage of the 360-degree views of the East River and the Brooklyn, Williamsburg, and Verrazano bridges on one side and the Manhattan skyline on the other. The ultimate goal was to create a casual atmosphere that would inspire creativity and promote collaboration among creative teams in an efficient space. 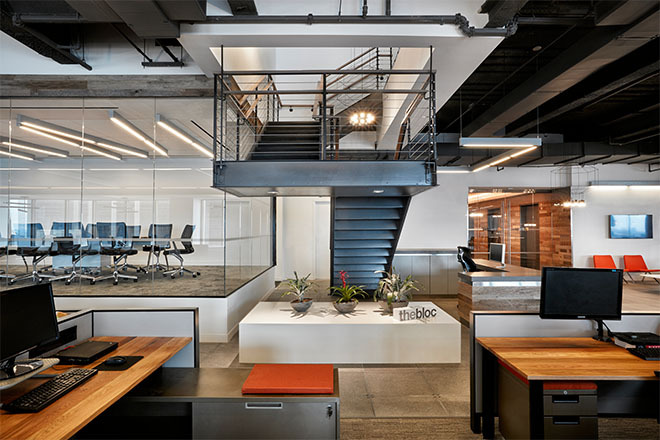 To bring something of a loft-like flavor to the 55,300 square feet of open space in a 20th-century office tower, the designers started by varying the expansive floor plates with shallow platforms and mezzanines, which brought texture and definition to the space without walls and without blocking the spectacular views. “The space is quite amazing in its simplicity,” says Olivier Wilkins of Mufson, who served as project manager. “How to make all the views visible from any place in the space was the primary driving force of the design concept.” At the core of the space, private offices and conference rooms are clustered on 24”-high raised mezzanines, while reconfigurable work stations spread out in a central area beyond with custom sculptural wooden benches and relaxed seating—including Teknion’s DNA couches and laptop tables at perimeter meetings areas—so that everyone can take advantage of the views along the prime real estate at the windows. In other parts of the offices, private telephone spaces, a kitchen area, and lounge rooms offer additional spaces for private conversations or informal meetings. Another critical client demand was amply flexible systems furniture. 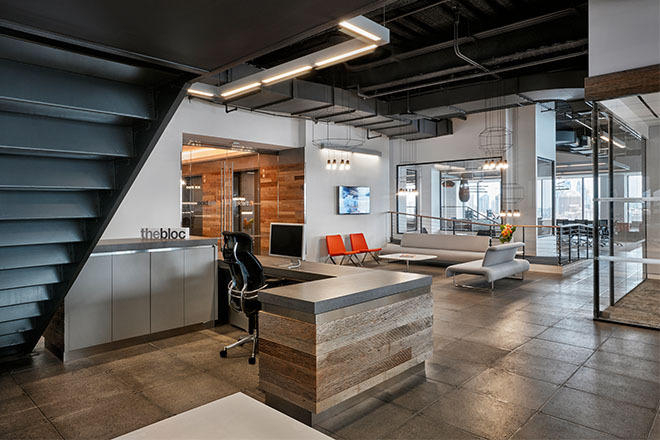 “Our workflow is so dynamic and we organize around teams that require significant relocations within our office every six to seven months or so,” says The Bloc’s co-founder, Susan Miller Viray. “It’s the nature of a client service business,” she explains. 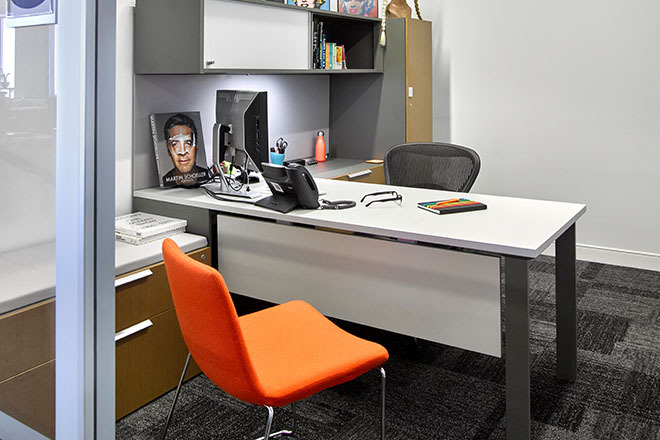 Teknion’s custom-fabricated District workstations also enable the company to address its ever-changing organizational needs with ease. 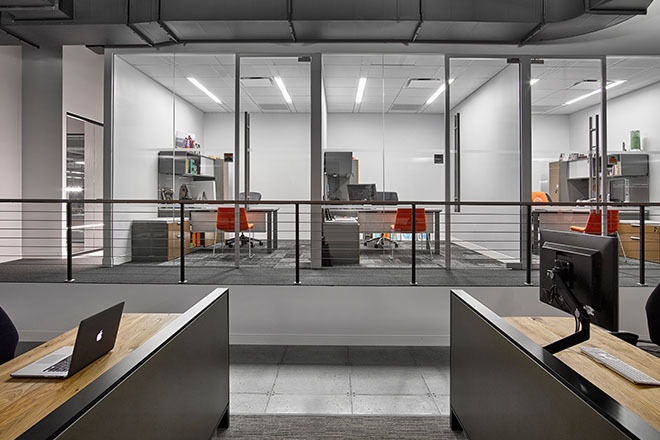 Teknion's custom-fabricated District workstations also enable us to address its ever-changing organizational needs with ease. Another out-of-the-box gesture enhances employee comfort without sacrificing efficiency. By smartly placing low-paneled workstations in an atypical pattern instead of in linear rows, resistance to the loss of privacy that open-plan offices often yields was more easily overcome. “Now when people look up they’re not staring straight into someone else’s eyes, which psychologically creates a greater sense of privacy,” says Miller Viray. To accomplish the spatial arrangement, the architects and the client worked carefully with the dealer, Furniture Consultants, Inc., to create the variable furniture plan and ease its installation. 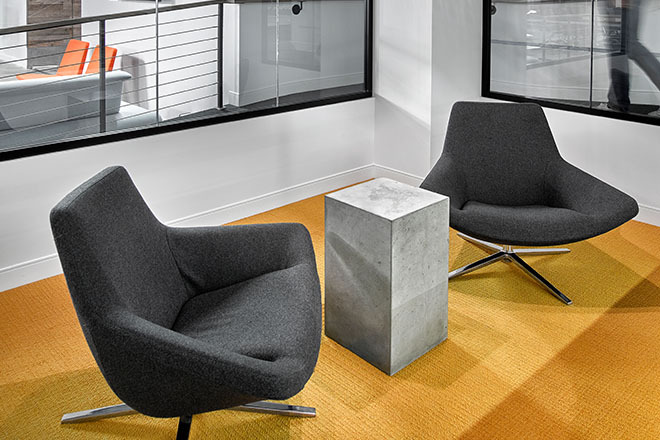 Custom cushions on top of the filing pedestals also allow colleagues to sit and collaborate together at individual workstations. ”It’s being used just as we envisioned it being used,” says Miller Viray. Adjusting the budget to allow for quality materials and thoughtful furniture placement elevates the character, while preserving efficiency. 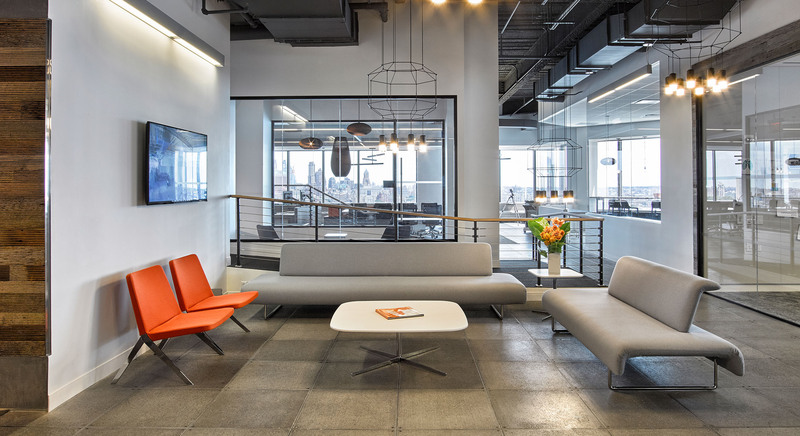 The client was able to choose wool and felt fabrics in a mix of gray hues with pops of orange—its corporate color—from Teknion’s standard lines to lend warmth and substance to the space. They also brought style and substance to other areas with furnishings from Studio TK, including Keele chairs, Envita coffee and side tables, and Cloud couches in the reception, and Metropolitan chairs from Studio TK’s B&B Italia collection in the lounge/phone rooms.